Features: Floating and silking control. Description: Highly effective at controlling silking, floating, and flooding while also eliminating such surface defects as fisheyes and craters by reducing the surface tension. It is an excellent fluidizer, producing better atomization and orange peel control. Additionally, it is helpful in reducing or eliminating microwrinkling, greatly improving both gloss and clarity in such applications as automotive finishes. When Clarity of Reflection Matters: helping resin systems achieve maximum clarity of reflection and gloss by reducing or eliminating surface imperfections. 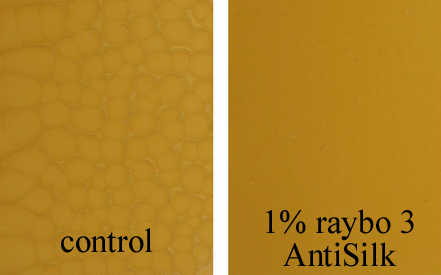 Raybo 3 Antisilk, when added to fast drying systems containing fast drying solvents (i.e. 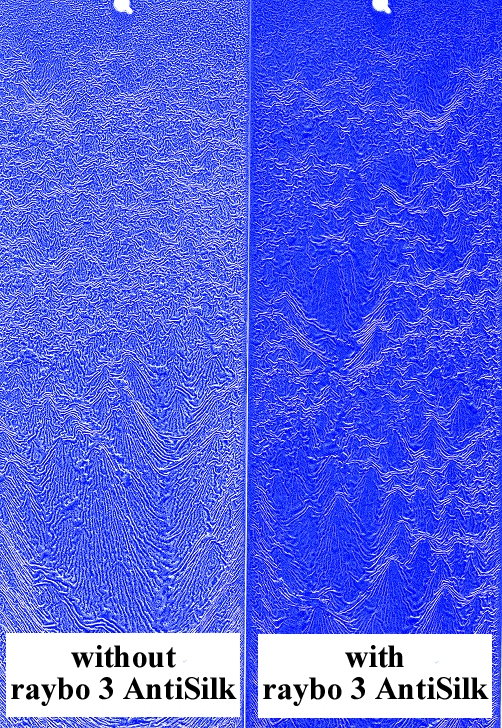 t-Butyl Acetate, MEK, Acetone) helps to eliminate surface imperfections resulting in improved film formation (images as seen under the microscope). 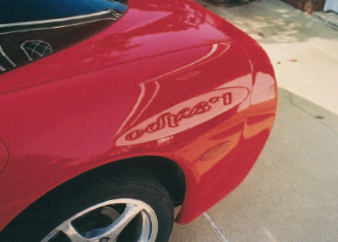 Blue metallic vault paint over wrinkle finish. Without raybo 3 Antisilk, the surface tension was to high, not allowing the paint to sufficiently cover the peaks, and the paint collected in the valleys of the wrinkle finish. With raybo 3 AntiSilk, the surface tension was reduced, allowing the paint to cover the peaks and valleys of the wrinkle finish.